Sometimes, if a festival is organised well enough, it barely feels “organised” at all. The stages, decorations and installations feel as though they’ve always been there, the assigned paths feel like mere guidelines through a forest where any route could take you to something special. The music, from hairraising techno and electro to jubilant Afrobeat and funk, all feels totally fitting, the sounds coursing through the trees as naturally as a breeze, beckoning festival-goers to get loose on the woodland floor. Lost Village is one such event. Taking place in the heart of the Lincolnshire countryside – in the forest by the village of Norton Disney – the festival’s fourth outing finds it expanding in capacity without losing any of its cosy charms. Expert musical curation that veers to the more indie-inclined electronics of Friendly Fires, Everything Everything, Maribou State and Mount Kimbie is propped up by the exceptional line-up of DJs which ranges from tough, heady electro, techno and drum & bass from the likes of Helena Hauff, Or:la, Avalon Emerson, Goldie, Ben UFO and Daniel Avery to the more jubilant and loose house, disco and funk sounds of Honey Dijon, Awesome Tapes From Africa, Jayda G, Hunee and Gilles Peterson. In short, Lost Village is seamlessly put together, with every "t" crossed and "i" dotted with a rustic flourish. The food options are great and varied, and well catered toward vegetarian and vegan needs and the frequency placement of bar tents around the site means that the queues for a pint are never as harrowing as they so often can be. Actors and players donning Alice In Wonderland-esque garb flock around the festival site, scaring the living daylights out of unsuspecting punters, making great comedy for everyone else. The effortlessness and ease with which the festival runs – even despite the heavy rain on Sunday morning and afternoon – genuinely feels to be echoed in the music played by the DJs throughout the weekend. No one DJ adheres to strict expectation and surprise after surprise is met with an almost universal success rate. Gilles Peterson manages to drop Kanye West’s ‘Lift Yourself’ before it gets to the harrowing “Scoopidy Poop” bit before also dropping an uncharacteristically heavy series of tracks featuring Ploy's massive summer heater 'Ramos'. Four Tet drops Destiny's Child, Nelly Frutado and Ariana Grande edits along with General Levy's 'Incredible' and T2's 'Heartbroken'. The Black Madonna plays a set chock full of drum & bass cuts on Friday (before giving an inspirational and fun Q&A the following day), Ben UFO drops a stunning ambient cut from Pariah’s new album toward the apex of his wild electro and techno set. 2ManyDJs manage to play an infinite number of cheesy bangers without anyone so much as batting an eyelid. And that, really, just scratches the surface. 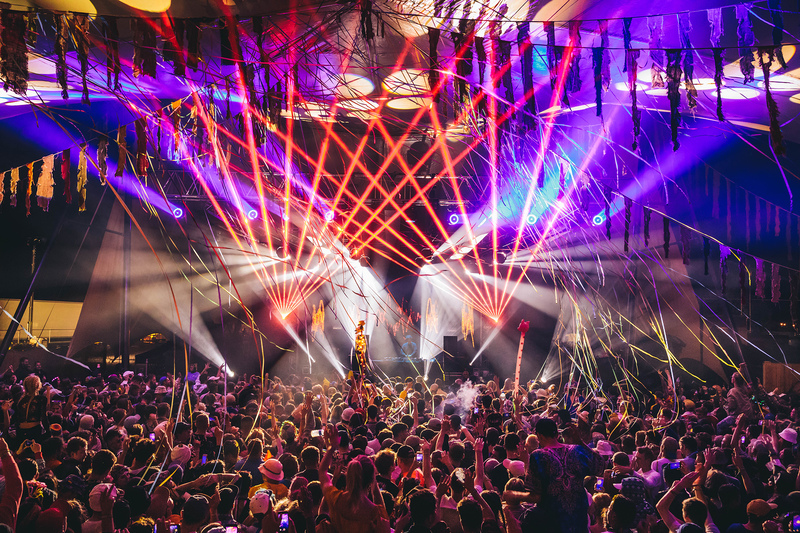 The looseness, playfulness and “anything goes” attitude that courses through Lost Village makes it the ideal festival for anyone who wants to get away from the pretensions and dull expectations of the everyday while still getting to catch their favourite DJs play. Add to that a picturesque woodland backdrop and a magisterial lake to chill out beside, and you’ve really got yourself a winner. The only gripes to speak of, however, perhaps come linked to the looseness and flipancy of the festival crowd. Despite the festival organisers specifically requesting that no one bring native American headdresses, the instances of cultural appropriation are disappointingly prevalent. That, coupled with the frankly astonishing amount of trash, tents and air mattresses left behind on the campsite come Monday morning served to put a slight dampener to an otherwise near-perfect weekend. Below, you'll find a playlist of 25 massive tracks played throughout the festival that speak to the unbridled fun of one of the UK weekenders that does it best. Want more? Check out our review and tracks playlist from the incomprable Houghton festival from August.